Comes with the function to convert SWF to WMA by 4Easysoft SWF to WMA Converter. You also can convert SWF, 3GP, 3G2, WMV, FLV, ASF to MP3, WMA, MP2 audio syncing to your MP3 players. The intuitive interface of 4Easysoft SWF to WMA Converter. makes it easy enough for both novices and pros, split one video into several ones, choose subtitle and audio track and adjust various parameters to get custom WMA file you want. Just free download 4Easysoft SWF to WMA Converter and have a try. 4Easysoft Total Video Converter brings you all the capabilities to make polished video/audio files, which can convert all mainstream video and audio formats, and extract audio tracks from video files to other audio formats. 4Easysoft SWF to WMA Converter can extract or convert SWF to WMA, MP3, MP2 for the playback on your digital players, it adds the function to convert 3GP, 3G2, WMV, FLV, ASF to WMA, MP3, MP2 for your music enjoyment. Extract certain segment form movie or music by presetting the exact start and end time or just dragging the slider bar. 4Easysoft SWF to WMA Converter provides an easy way to combine and join multiple files together. Take snapshot to capture the image of highlight while previewing movies. Detailed audio settings are provided by SWF to WMA Converter tool for you to adjust, such as Encoder, Audio Channels, Sample Rate and Audio Bitrate. You also can save all the output settings as your preference, which is saved in the user-defined column automatically. Allow you to conveniently choose preferred audio track and subtitle. You will get output FLAC audio with perfect sound quality. Having the user-friendly and smartly organized interface, 4Easysoft SWF to WMA Converter brings you more convenience and enjoyment. Conveniently choose preferred audio track and subtitle. Convert any video to flash SWF, FLV. Convert any video, like AVI, WMV to SWF. Convert mainstream videos to ASF files,WMV. Convert DVD to flash video FLV, SWF formats. Convert files from ASF to WMV(.asf to .wmv), ASF to WMA, MP3. Convert SWF to AVI and all popular video formats. Convert SWF to FLV for playing on Youtube and Flash Video Player. Convert FLV, WMV, ASF, 3GP, 3G2, SWF to FLAC. Convert SWF to AVI, HD AVI, DivX HD (.avi), XviD HD (.avi) for BlackBerry, Archos, Creative Zen, iRiver, PSP, PS3,etc. Convert FLV, SWF to FLAC audio. Convert mainstream video files to YouTube FLV, SWF format. Convert YouTube FLV videos to mainstream videos (FLV to WMV video, FLV to AVI video etc). Convert SWF and FLV to 3GP video. Convert FLV to iPod video, iPhone, Apple TV. Convert .FLV SWF video to popular formats (MPEG, MPG, AVI,VOB). Convert .FLV to .ASF and WMV. Convert flash videos SWF/FLV to mainstream videos. 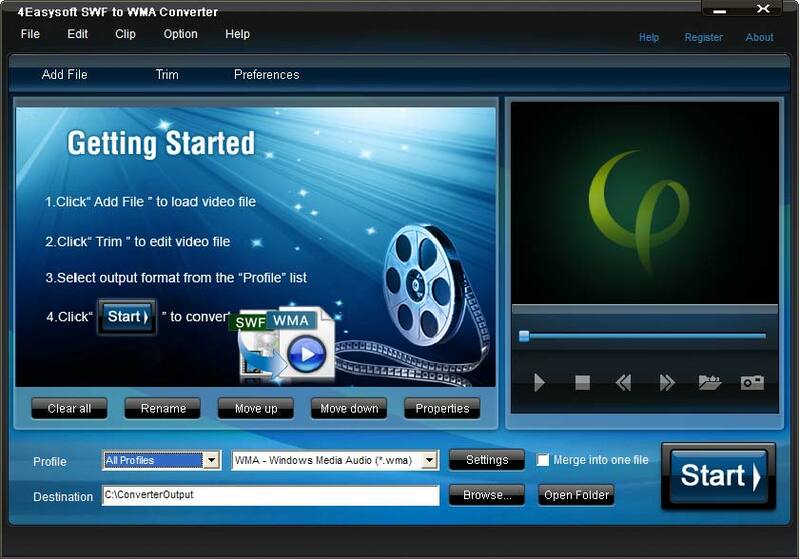 Convert flash videos to WMA, extract audio from FLV SWF to WMA. Convert flash video to popular formats (FLV to MPEG4, SWF to MPEG4).